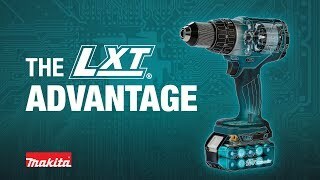 Makita delivers corded grinding performance without the cord with the 18V LXT® Lithium-Ion Brushless 4-1/2" / 5" Cut-Off/Angle Grinder with Paddle Switch Kit (model XAG11T). It's powered by a Makita brushless motor for longer run time, increased power and speed, and longer tool life. For the most demanding applications, Makita’s exclusive Automatic Speed Change™ Technology automatically adjusts speed and torque during operation for optimal performance. For added convenience, the XAG11T has an electric brake that stops the wheel in 2 seconds or less upon release of the paddle switch. The 18V LXT® 5.0Ah battery charges in only 45 minutes for less downtime and increased productivity. The XAG11T is ideal for grinding, cutting and sanding a wide range of materials including tile, concrete, pipe, conduit, and more. For improved tool performance and extended battery life, Makita created Star Protection Computer Controls™. Star Protection is communication technology that allows the Star Protection-equipped tool and battery to exchange data in real time and monitor conditions during use to protect against overloading, over-discharging and overheating. For increased versatility, the tool can also be powered by Makita 18V LXT® and Compact Lithium-Ion batteries with the Star Symbol™ on the battery indicating Star Protection inside. Net Weight (with battery) : 5.8 lbs. Shipping Weight : 15.39 lbs.